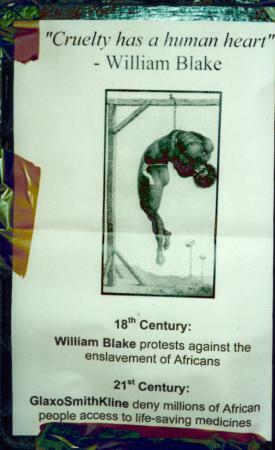 Report of a 2001 action at the Tate Britain Gallery in London, against a William Blake exhibition sponsored by the pharmaceutical giant GlaxoSmithKline. On the final day (11 February 2001) of the William Blake exhibition at the Tate Britain Gallery in London, 30 people gathered on the steps outside to reclaim Blake from 'the dead hand of capital, empire and state' and to denounce the corporate sponsors of the Blake exhibition, GlaxoSmithKline. "The William Blake exhibition at the Tate Britain gallery makes it clear that Blake was a revolutionary as well as a visionary – yet bizarrely it is sponsored by one of the world’s biggest pharmaceutical companies, GlaxoSmithKline (formerly Glaxo Wellcome). While Blake railed against poverty and oppression, GlaxoSmithKline is denying millions of African people with HIV access to drugs that could save their lives" (full text of leaflet below). The action at the Tate happened the day before a march demanding affordable HIV treatments was due to take place in Cape Town, South Africa organised by the Treatment Action Campaign. The action got a very good response from visitors to the Gallery, many of whom stopped to listen to what was going on. One passer-by who joined in and read out a Blake poem told the crowd - 'the spirit of Blake is here on the steps'. The Tate management were less sympathetic, calling the police (although there were no arrests) and banning people from going into the gallery, for the crime of reading out extracts of Blake - while inside they were charging £8 for the privelege of seeing works by the same artist. The William Blake exhibition at the Tate Britain gallery makes it clear that Blake was a revolutionary as well as a visionary – yet bizarrely it is sponsored by one of the world’s biggest pharmaceutical companies, GlaxoSmithKline (formerly Glaxo Wellcome). While Blake railed against poverty and oppression, GlaxoSmithKline is denying millions of African people with HIV access to drugs that could save their lives. In Britain and the USA, combination therapy with anti-retroviral drugs has transformed the life chances of people with HIV. But of the world's 34 million people infected with HIV, 25 million live in sub-Saharan Africa: and only 25,000 Africans (0.001 per cent of those infected) receive the drugs. The reason is that that they and their governments cannot afford to pay the market price for them. Anti-retroviral drugs can be manufactured for a fraction of the price they are sold by GlaxoSmithKline but this would undermine profits. That is why Glaxo and other drugs companies are taking the South African government to court to defend their ‘intellectual property rights’, i.e. to prevent South Africa from making or buying abroad cheap, generic copies of anti-HIV drugs to treat patients. Similar threats have been made against other African countries. Glaxo and the British government claim that companies have a right to protection for the drugs they sell at high prices in order to recoup research and development costs. Glaxo have already made millions from AZT and 3TC, the two drugs in Combivir, and in any case they were developed with the help of public funds in the United States. The problem isn’t just GlaxoSmithKline – other drugs companies like Pfizer act in the same way. It isn’t even just the drugs industry or multinational corporations. They are backed up by the British state and by the World Trade Organisation’s TRIPS agreement (Trade-Related Aspects of Intellectual Property Rights) which allows owners of ‘intellectual property ’to control the exploitation of their inventions worldwide, determining the price at which they can be sold and the royalties they receive. They are backed up by the whole logic of capitalism which decrees that ideas, objects, fields, buildings, even genes, can be the sole property of companies and wealthy individuals to be financially exploited at will. In placing their logo on the art exhibitions, corporations like Glaxo Wellcome are laying claim to the creative energies of the past. In denying lifesaving drug treatments, they are demonstrating how the creative energies of all of us, including medical knowledge, are subordinated to the creation of wealth rather than the meeting of our needs.